uuid : 6ca502fd-bf90-43c9-8380-35b57cb2ae5a templates_id: 119576 templates_uuid: "1b01f67b-0d40-42ec-98d4-e838bb9503eb" title: "Affidavit Form - Create Free General Affidavit Template" display_name: "Affidavit" meta_keywords: "Sworn affidavit or Sworn statement" description: "
You may be required in certain situations to give a sworn written statement. This form contains everything you need to create a general affidavit. Make sure that you sign and swear in front of someone commissioned to receive oaths (eg a solicitor) who must also sign. Swear to a statement of truth using this affidavit form. An affidavit is a written statement from an individual which is sworn to be true (an oath) which is signed by the affiant (the person making the oath) and also a notary public or other judicial officer that administered the oath. An affidavit must be made voluntarily and under either religious oath or affirmation. It is therefore required to be signed in front a person commissioned to receive oaths under legislation, eg. a solicitor. You will normally need to use affidavit along with the witness statements to prove the truthfulness of a certain statement in court. You may need one in civil proceeding or when the court requires you to make an oath to tell the truth when giving oral evidence at trial and when you make an oath to verify one or more written statements of fact. What should the content of an affidavit be? The content of an affidavit should be your personal knowledge of the situation. In some circumstances, personal knowledge can include personal opinion rather than fact, however, it must be stated that this is simply opinion and not fact. As the document is accompanied by a legally binding oath, it is imperative to ensure that the facts are clearly and accurately represented. If you are unsure what the content of the statement should be Ask a lawyer. What are examples of circumstances where an affidavit can be used? An affidavit can be requested in any dispute before a court such as divorce proceedings, property disputes and debt cases. In some circumstances, the use of an affidavit is mandatory and set out in legislation. Examples of mandatory affidavits include applications for search orders or freezing orders. Does an affidavit need to be witnessed? In most cases, there is a requirement that an affidavit must be signed in the presence of solicitor or in front of a notary public or judicial officer. What happens if you knowingly make a false affidavit? Falsely swearing an affidavit is punishable under the Perjury Act. If you knowingly make a false statement included in an affidavit, you may be found to have committed contempt of court. It is punishable by fine or imprisonment or both. This affidavit is governed by the law of England and Wales.
" created_timestamp: "2018-10-08 04:37:05.0" modified_timestamp: "2018-10-08 04:37:05.0" active: true created_by: 102 modified_by: 102 dcm_id: 318 url_slug: "Affidavit" meta_description: "Create an Affidavit form with step-by-step instructions. Swear to statement of truth using this affidavit template." time_to_complete: "10 minutes"
More than just a Affidavit template, our step-by-step interview and guidance makes it easy to create your document. Easily create online, download, print and sign your free Affidavit in minutes. 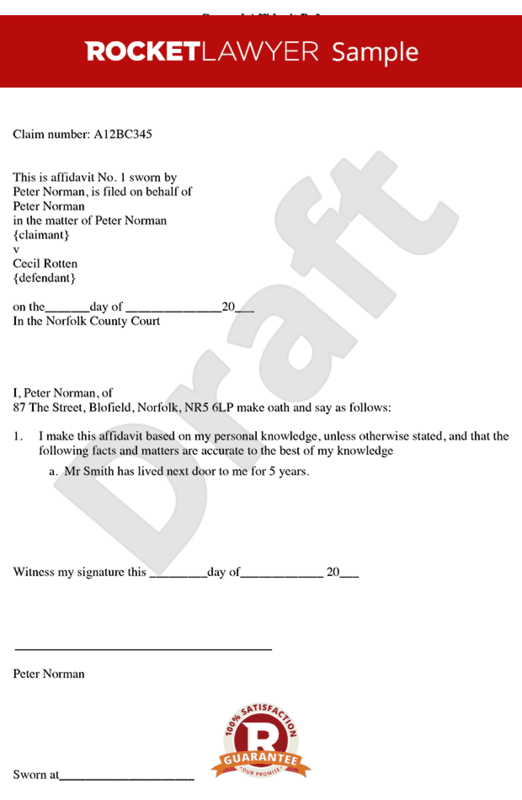 This document is also sometimes called: Sworn affidavit or Sworn statement.